We are able to order this palette for you. Our shipments usually arrive around 11:00am on Tuesdays and Thursdays. Masterson's multi-purpose palette for all your painting needs... acrylics, watercolors, oils. Join the thousands of artists, students, instructor and hobbyists who choose Masterson Art Products for all of their palette and paint storage needs. 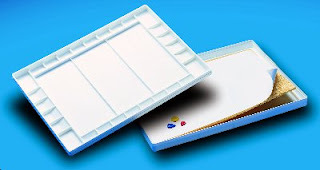 For use with Acrylics use Masterson's patented "Sta-Wet" palette paper and sponge (5 sheets and 1 sponge included). Paints will slowly absorb moisture from the sponge to keep paints wet for hours while the palette is open. The lid will keep your paints clean and moist for days, even weeks! The Super pro features 28 separate wells for holding pigments and 3 divided mixing areas to keep your color ranges separate The inverted lid can be used as an additional, larger mixing area. The lid will keep your paints clean between painting sessions. For use with Watercolors move the paper and sponge and use all the wells and mixing areas to work with your paints. For use with Oils, remove the acrylic palette paper and sponge, insert your favorite oil palette paper (not included.) The lid will keep your paints clean and help retard drying.